How do you feel about Pinterest? Love it? Hate it? Hear what MomSource Team member, Andrea Dake, has to say about her latest Pinterest project. Like so many moms, I have a love/hate relationship with Pinterest. On one hand, it gives me great ideas for holidays, parties, recipes, decorating, gifts, etc. It’s a great distraction when my brain is fried after a day of work, meetings, 1st grade homework, picking up toys and cleaning up dog vomit. On the other hand, it makes me feel totally inadequate, not only as a mom, but as an adult person. Who seriously has the time and energy for half the stuff on there? Not I. Step 1: Gather up all the broken crayons your kids have. If they’re like my kid, there are more broken ones than whole ones. Step 2: Get your Starbucks. 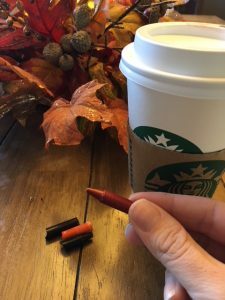 A PSL would be an appropriate choice for this craft. Step 3: Cover your table with a disposable covering. I have a plastic “crafting” table cloth that we use for Easter egg decorating, Play-Doh, Christmas cookie decorating, human sacrifices and spaghetti night. Step 4: Peel the crayons. 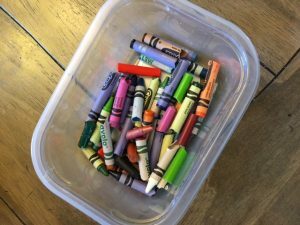 You want naked crayon pieces. And break them into smaller pieces if they are over 1 inch long and you’re using them on a small-ish pumpkin. 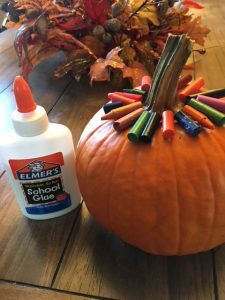 Step 5: Glue the crayon pieces around the top of the pumpkin. I used regular school glue since it was what I found in the drawer closest to me. This did not work so well. It took forever to dry and then several of them fell off during the heating process. Booooo. In hindsight, I should have used my glue gun. 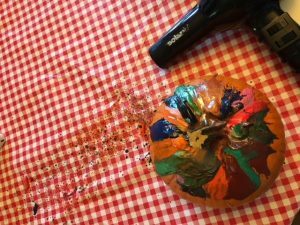 Step 6: Get out your most expensive salon blow dryer and start heating the crayons a few at a time. This is where your PSL comes in – melting all of them takes time so relax and sip! Now, a word of caution – once the wax starts to melt, it will splatter everywhere. Do NOT put your dryer on the highest blow setting. High heat is good. High wind is not. It will take you a few minutes to figure out the angle you need to hold the dryer at to get it to run down the pumpkin. 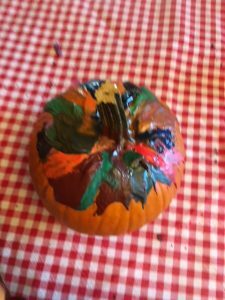 Then you can just move the dryer around the pumpkin, melting a few crayons at a time. 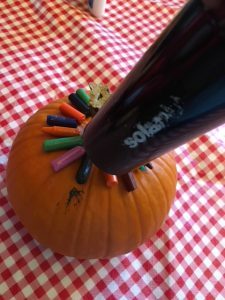 Also, do not keep any valuable objects near your pumpkin, like for example, the phone you’re using to document your stunning craft project or else you’ll get hot wax splatter all over it (happened to a friend). So, there you see the finished product. Definitely not as awesome as some of the melted crayon art that I’ve seen. There is absolutely a technique to it that I have not yet mastered but I can confirm that the process was simple enough to hold my kid’s attention and he could help throughout. I wouldn’t call this one a “slam dunk” but it definitely wasn’t a “fail” either. More of a Pinterest “Meh”. But what the hell else are you going to do with all those half-eaten crayons?